Today I’m joined by Arts Educator extraordinaire, Amanda Gross, who’s back to show us how to make a Fall Luminary from leaves and melted crayons. 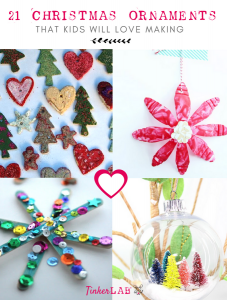 Not only are these beautiful, but the processes of collecting leaves, peeling crayons, and melting the wax with an iron are sure to capture a child’s attention. 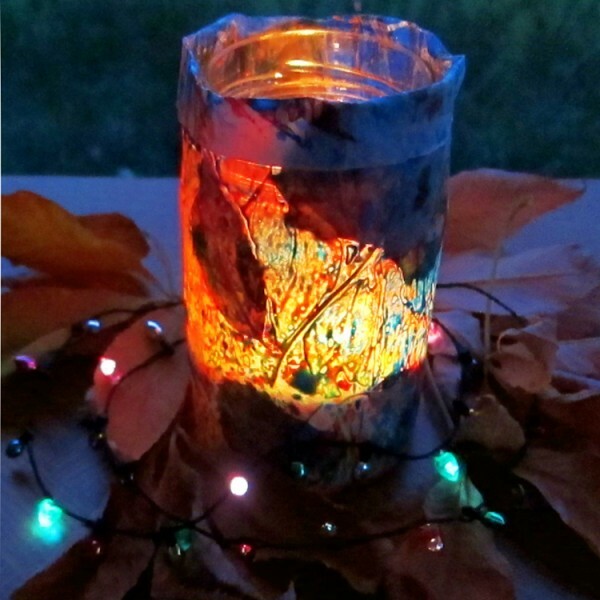 Luminaries are perfect for brightening a crisp autumn evening, and a crafty way to explore this season when leaves turn brilliant colors, the rosy twilight falls more quickly, and families the world over traditionally give thanks for the harvest. 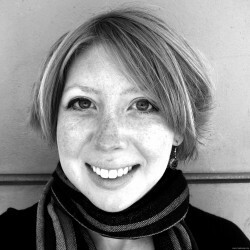 You might start by reading a book that poetically investigates the unique things of autumn, such as Lois Ehlert’s Leaf Man or Lauren Thompson’s Mouse’s First Fall. 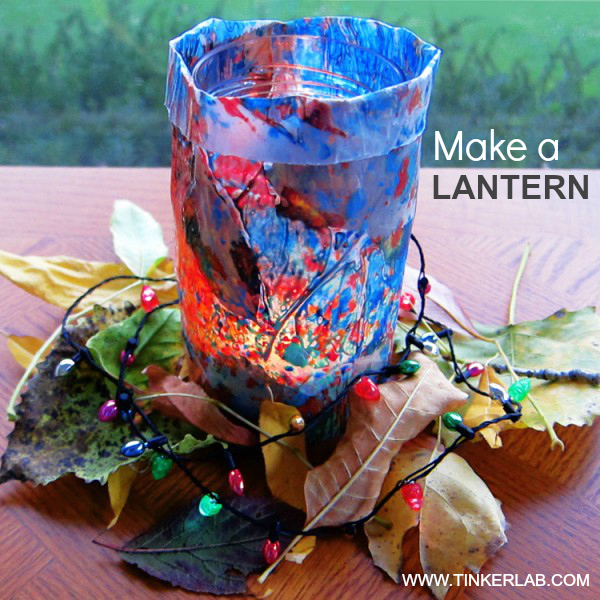 Would your child like to make a colorful fall luminary, choosing materials from outside and around the house? Wander around outside, and notice how the leaves have turned a multitude of colors and have gotten crunchy. 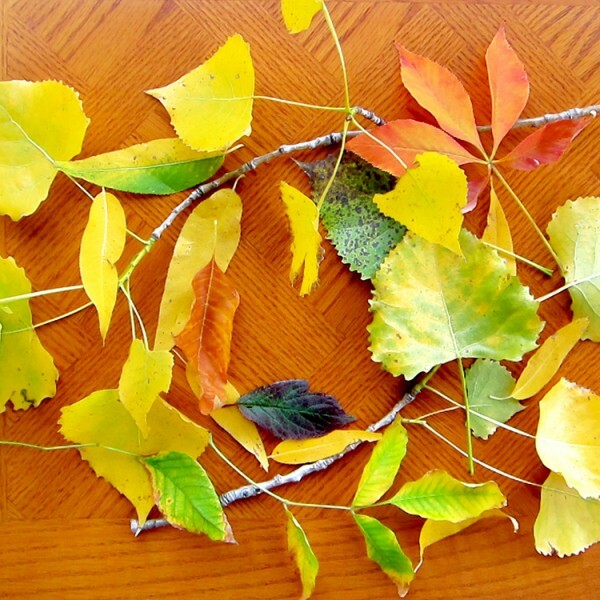 Choose leaves that have fallen off of trees, but are not too dry and can still lay flat. If leaves are very curly, you may consider pressing them in a heavy book for a few days, before using them. Bring your collection inside and onto a table. Find a clean mason jar that will serve as the structure for your luminary. 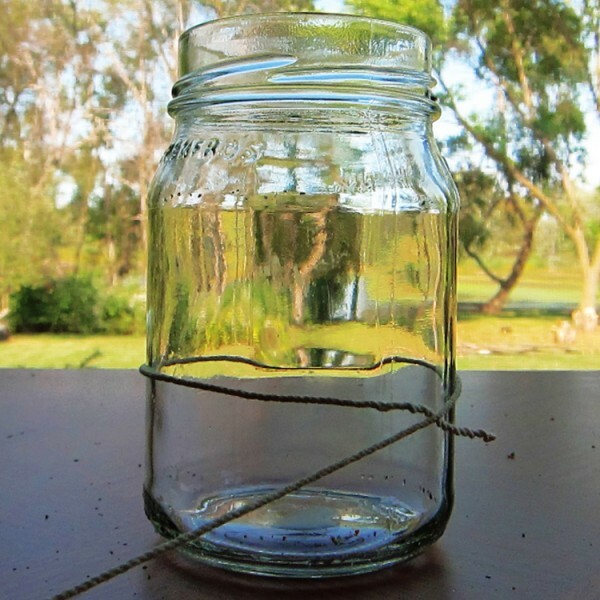 Measure the mason jar’s circumference with sting, and cut a wax paper strip that is long enough to fit around it. Gather crayons of your favorite colors. 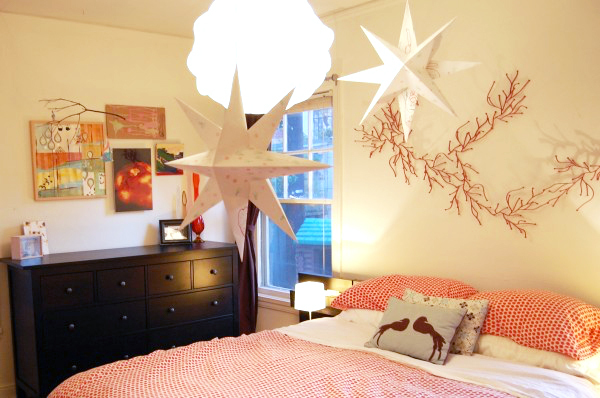 Lanterns for the Mid-Autumn Moon Festival are often inspired by butterflies, so any hue goes! 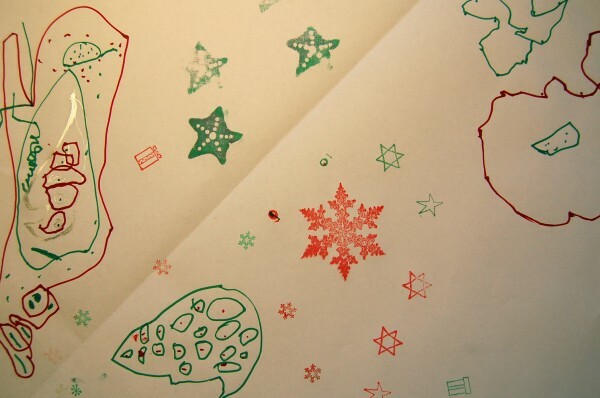 Unwrap the paper covering the crayons, and shave them lengthwise over the wax paper, with a serrated knife or vegetable peeler. If your child isn’t old enough to wield the knife, s/he could choose the crayon, the location, and how much pigment they’d like you to shave off. 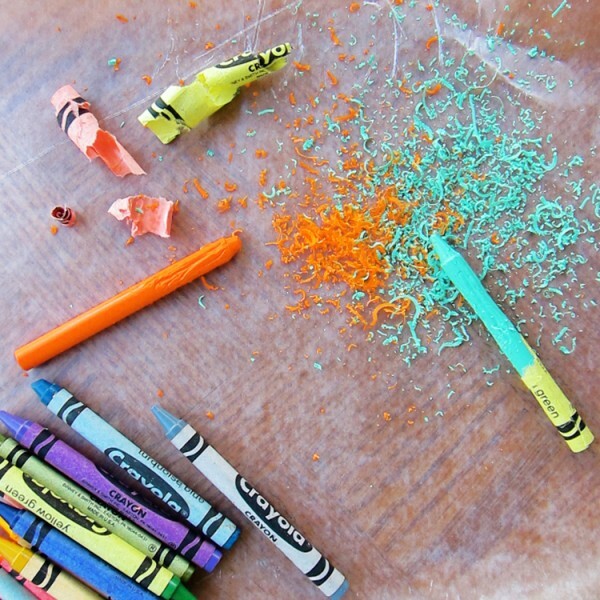 Place leaves over the crayon shavings, and feel free to add more shavings on top. 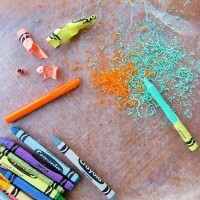 Explain that the crayon wax will melt, and those little crumbs will become puddles of color. Experiment with composition, and with layering the leaves and shavings. 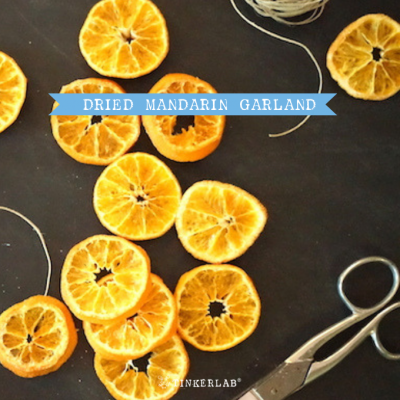 After waiting a few minutes for the wax paper to cool, peel away the cloth. Measure your mason jar again, and cut the wax paper so that it fits around the jar, then tape or tie a ribbon around it to hold the paper in place. When it gets dark outside, drop a candle into your mason jar, and ignite it with a long lighter. The brilliant, glowing colors and winding lines of the leaves will surely be a cozy centerpiece for your family to gather around, and is an excellent reminder to be grateful for the season. I have such a heavy heart today, friends, because we lost one of the good ones in this world. My dear friend, Steve, who happens to be one of the funniest, wisest, and most generous people I know lost his long battle with cancer. I wasn’t planning to post anything today, but the glow of these paper lanterns made me think about Steve’s shining light, and I thought I’d dedicate this post to him and his incredible wife, Jen. 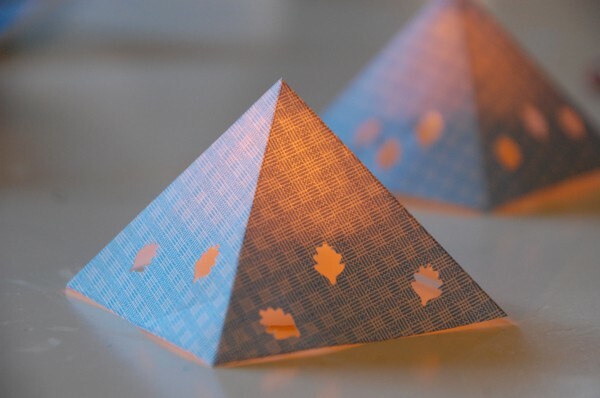 These were inspired by the Paper Lanterns from Willowday, and if you change up the paper patterns (or maybe make your own), these could become party decorations, Halloween luminaries, or bedroom night lights. 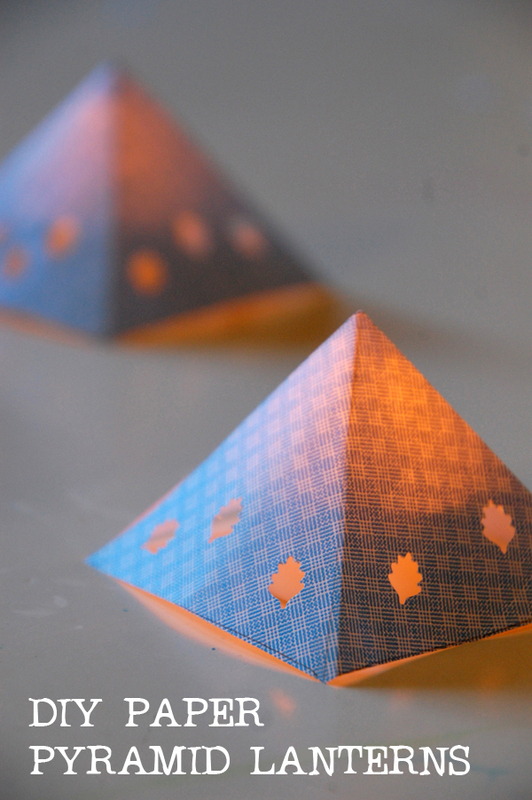 If you you happen to make these lanterns (and why wouldn’t you — they’re rad! ), I like to think that the glow might remind you that we’re each filled with enough light to brighten a friend’s darkest hour. Go on — spread some joy today. Life is truly short and we each have the capacity to touch the lives of others. 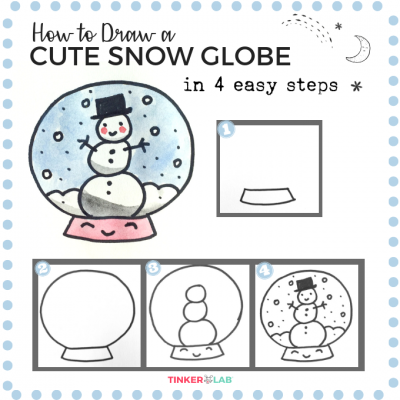 If you know me, you know that I like to get my kids involved in hands-on learning, and this is a good way to teach children how to carefully outline shapes, which in turn teaches patience and accuracy. 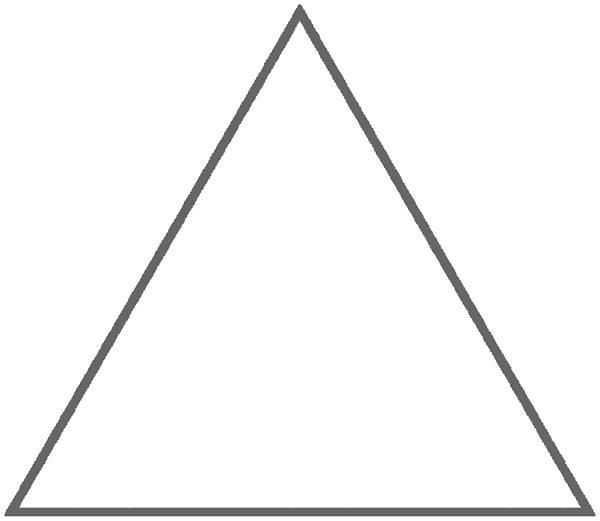 Step 1: Draw an equilateral triangle (or scale and print it) and cut it out. 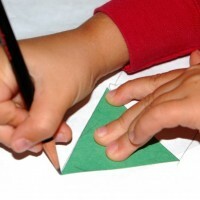 Step 2: Trace it onto a sheet of paper FOUR times. We drew ours onto a security envelope because we like to upcycle around here. And I’m super crazy about the patterns on these. Step 3: Cut the whole shape out. Step 4: Tape it together and punch holes into the sides if you’d like. Step 5: Add a battery-powered tea light (not a real candle, please, safety first) and decorate like mad. I love you, Steve and Jen. You’ll always be in my thoughts. If you like what you see here, we’d love to have you join our 7000+ member community on Facebook. 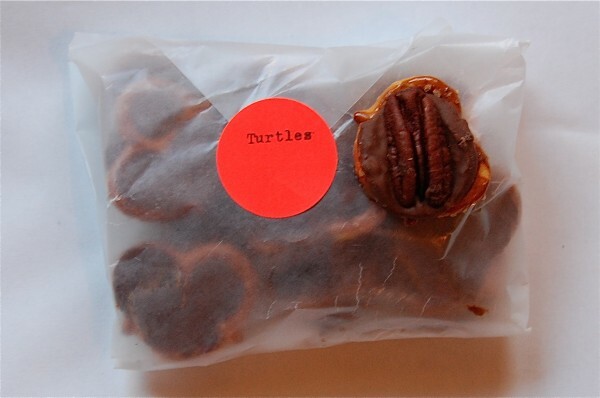 I’m working on a project with the San Francisco Children’s Creativity Museum, and one of the ideas we’re playing with is to create a buffet-style selection of materials for children to choose from in our DIY art zone. I’ll share some of our activities with you soon, but in the meantime I thought you might like to see how this strategy has manifested itself in my own home. 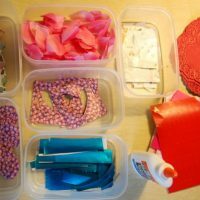 With Valentine’s Day right around the corner and a love for all-things-holiday in our house, I set up a smorgasbord of hearts, flowers, silk flower petals, shiny wrapping paper, doilies, stickers, and glue. Each clear container is filled with a thoughtfully-selected material as an invitation to make, play, and create. Oh, and invitations can be accepted or ignored. I always try to pay attention to how these things play out because, of course, I want my invitations to be accepted!! I barely captured any photos of my 3 year old making art because I was busy cutting paper and helping Baby R. But she made a Valentine for her sister and one for me. She draws her “M’s” upside down, so my name is spelled “WOW”… isn’t that great!? N stuffed the Valentines into her light-up Hello Kitty mailbox (the hand-made Valentine box we threw together last week truly couldn’t compete with this one!) and we opened our little parcels of love up at dinner. All in all it was a success, and I look forward to sharing more of these invitations with you soon. DO YOU SET UP INVITATIONS TO PLAY AND CREATE? 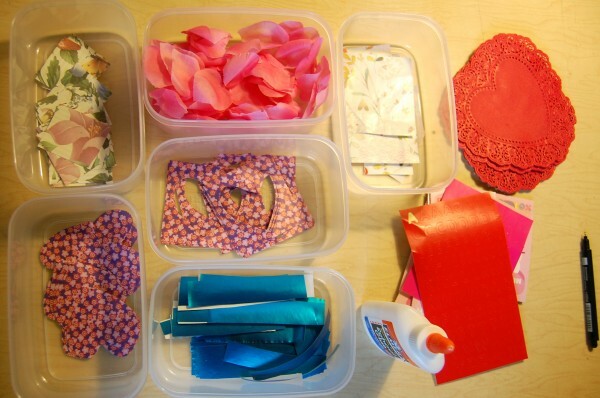 DO YOUR KIDS MAKE SELF SERVE VALENTINES? DO YOU THINK THIS STRATEGY COULD WORK FOR YOU? 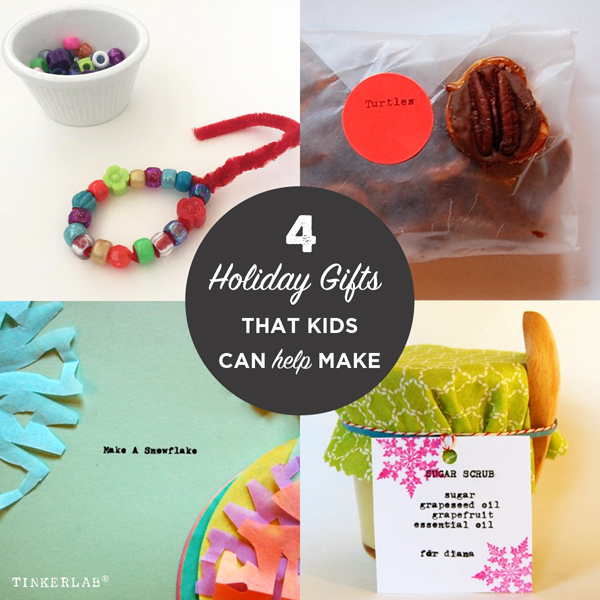 Could you use some ideas for last minute, easy holiday gifts that kids can help make? 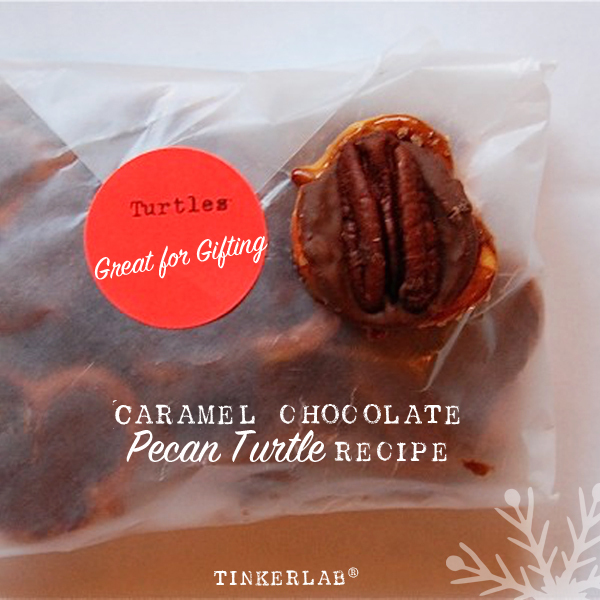 The following four projects are great gifts for friends, neighbors, grandparents, and even stocking stuffers. And my 3-year old helped make all of these projects, so they’re also all kid-tested. 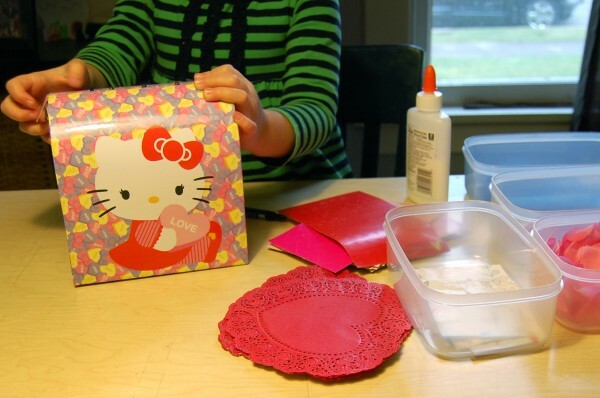 Collect a set of basic supplies (pipe cleaners and beads), and pull together your own craft kits for friends or cousins with young children. 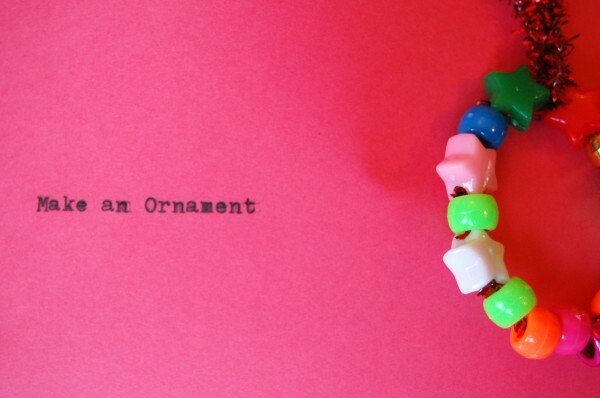 I folded a piece of card stock in half, typed (with this typewriter) “Make and Ornament” on one side (you could also stamp, print, draw this on, etc.) 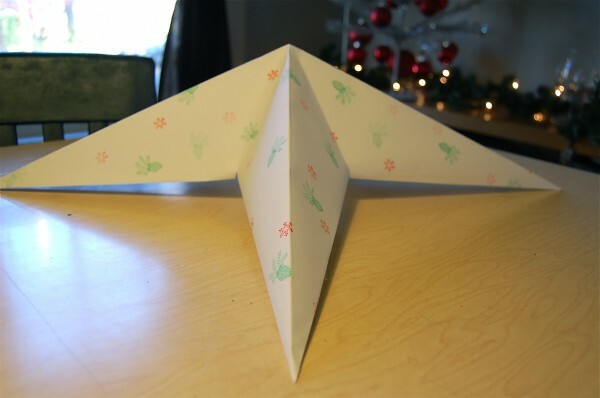 stapled up the sides, and attached an example of the activity to the side with a piece of clear tape. 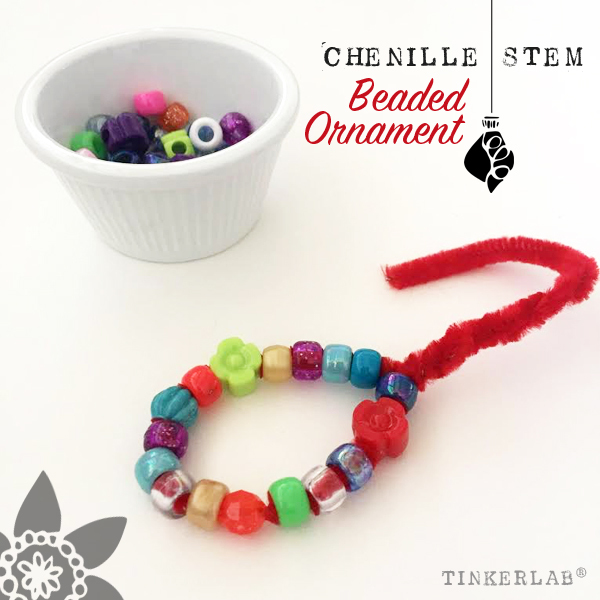 We filled the envelope with a small baggie of assorted beads (from a few big bags that we sub-divided) and four pipe cleaners that I prepared with a little bead-stopping loop at one end. 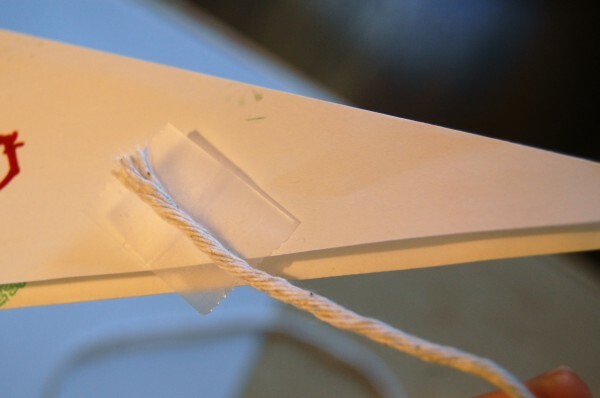 I prepared an envelope the same way, with typing, stapling, and filling. 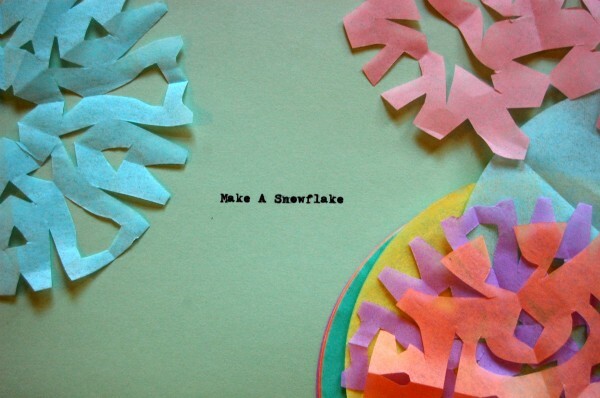 This time we placed a short stack of colorful tissue paper circles and a few pre-made snowflakes in the envelope for inspiration. 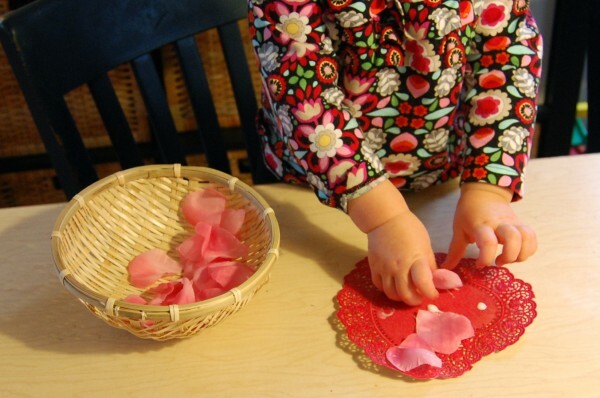 If you don’t have circular tissue paper on hand, a stack of flattened, round coffee filters or squares of upcycled magazines would also do the trick. 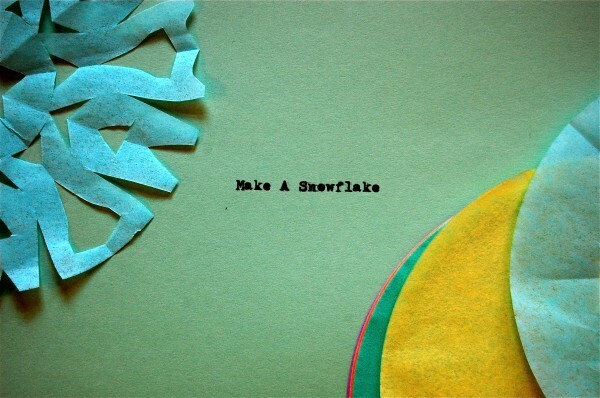 Include directions on how to make a snowflake: I love this tutorial for making snowflakes from squares of newspaper squares, from Maya Made. Collecting materials was the most time consuming piece of this project. I found the jars and wooden spoons at Daiso, a Japanese dollar store that rocks my world, and the essential oil was from Whole Foods. 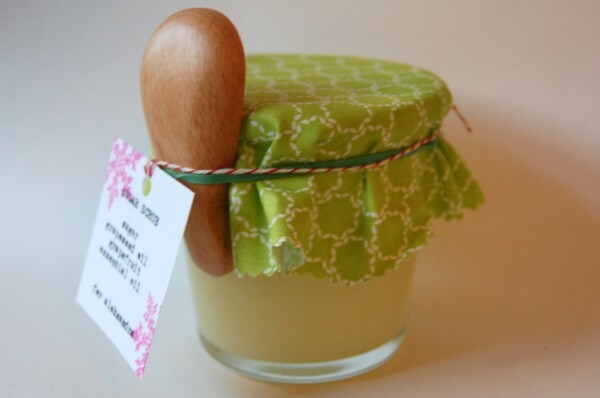 I used grapeseed oil (Trader Joe’s) because it’s virtually scentless and has a long shelf life, and I included a wooden spoon so that my friends can scoop out their scrub without adding bacteria into the jar. It’s not really necessary, but I think it’s a nice touch. I wish I was more scientific about this, but I’ll tell you how I made it and hopefully it will make sense. We filled 1/4 of the jar with sugar, added enough grapeseed oil to coat it, and then mixed it well. Then I added sugar to the 1/2 way point, added more oil, and mixed it again. I repeated this until the sugar-oil mixture was about 3/4″ from the top. I added a little more oil so that it floated on top of the sugar, making the whole mixture easy to stir. 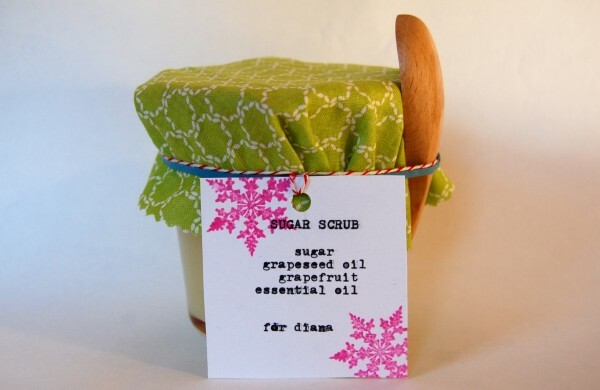 Once it was nicely blended, I added about 30 drops of grapefruit essential oil. How much oil should you add? I added the essential oil, smelled it, and then added more until I was happy with the strength of the smell. I thought about using lavender, which I also had, but the grapefruit smelled so refreshing and it complemented the green fabric. 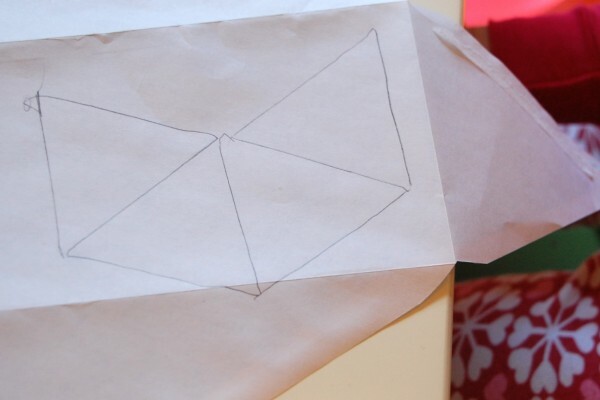 Lastly, I covered it with a circle of fabric (traced with a bowl), secured it with a rubber band (to hold that heavy spoon on tight), and wrapped a gift tag on with some baker’s twine. 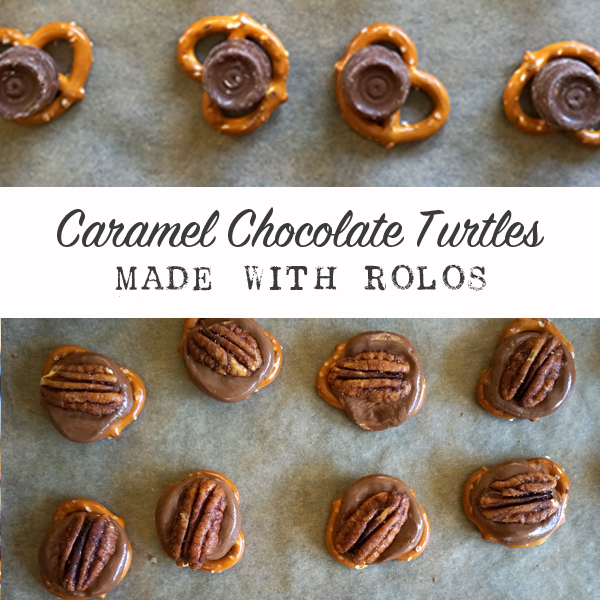 These Pecan Chocolate Turtles is so simple, absolutely delicious, and I made them with both my 1-year old and 3-year old. My one year old exercised some fine motor skills by unwrapping the candies, while my 3 year old placed them on the pretzels. 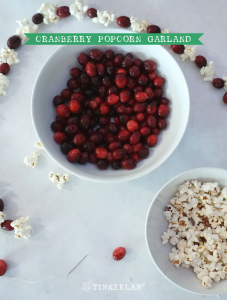 It was assembly-line cooking at its finest! They won’t disappoint you, I promise! 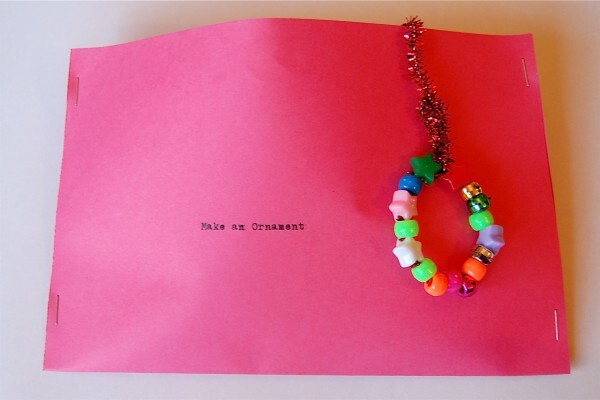 Handmade cards that kids can make. 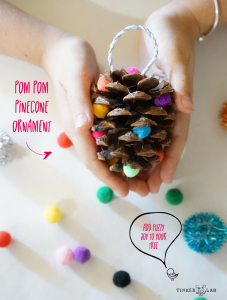 Today I’m sharing how to make an easy DIY menorah that are easy enough for even toddlers and preschool children to make. 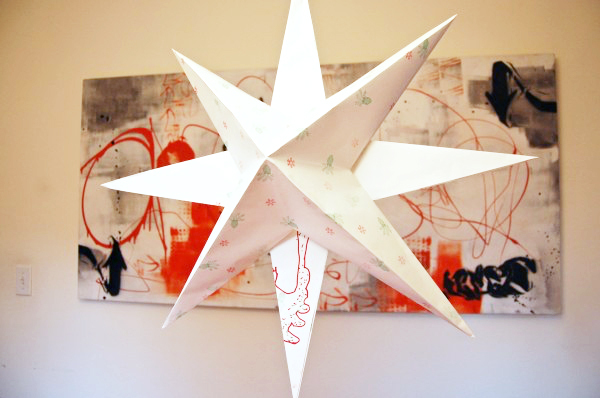 These menorahs are made with air-dry clay, so no baking is necessary. Acrylic paints for painting the surface. Liquitex is a solid brand. A note on clay: Crayola Air Dry Clay feels just like the clay you throw pots on, and my kids were enthralled by the texture. 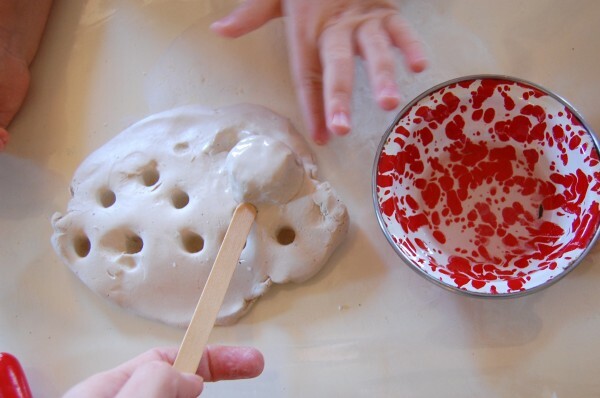 So unlike play dough, and it has the potential to make long-lasting objects. 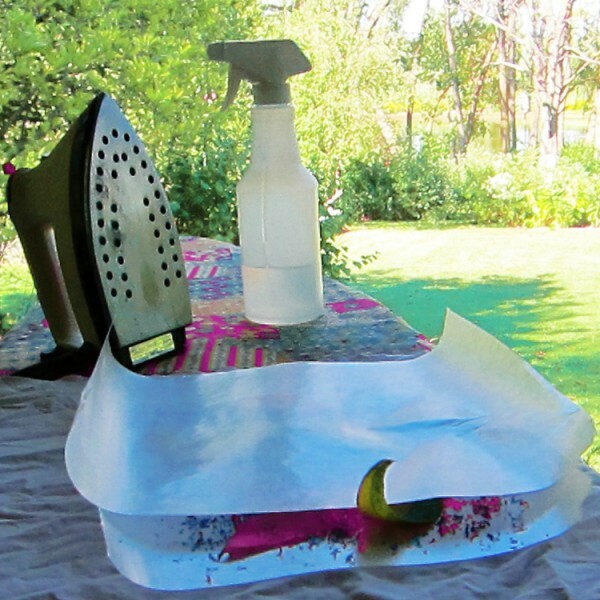 Cover your work surface with a vinyl tablecloth or work on a non-precious surface that easily wipes clean. If you’re making a Hanukkiah (it holds nine candles, rather than seven), talk about the story of Chanukah and how the Chanukah menorah has eight candles + 1, the shamash, to represent the miracle that oil burned continuously for eight days. 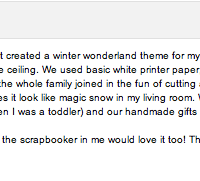 I like this kid-friendly version of the Hanukkah Story. Set up clay, water, and clay tools. 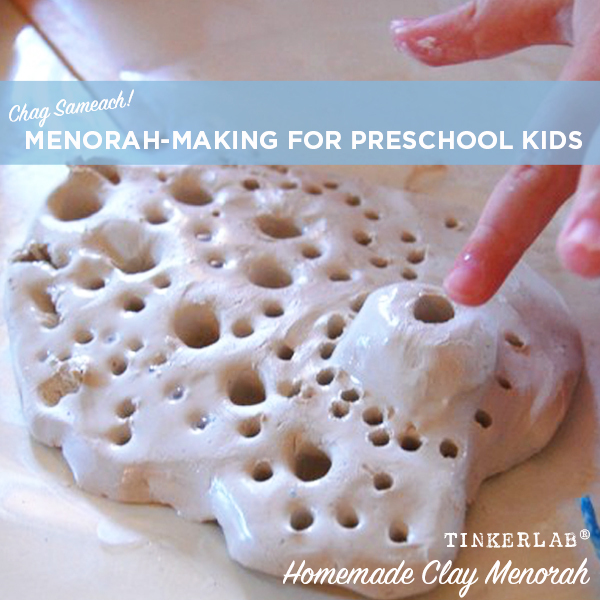 Invite your child/ren to make menorahs. Encourage creativity and original thinking. 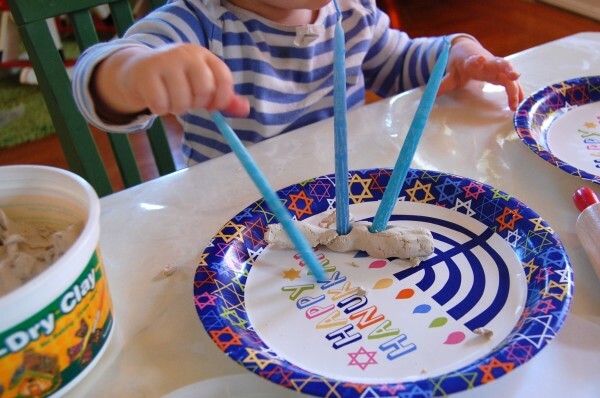 We looked at a metal Hanukkiah for inspiration, and talked about its shape and function. 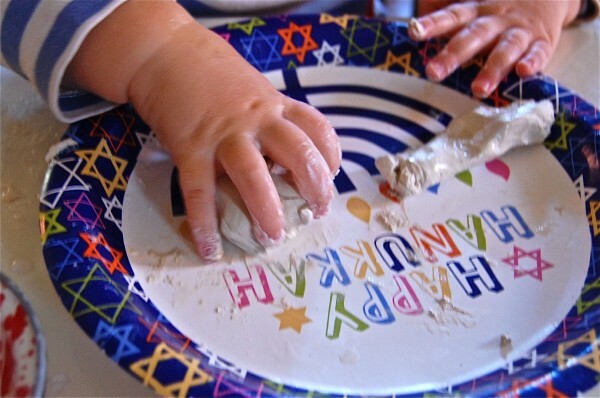 We rolled out some clay and I invited my preschool daughter to poke holes in it with a menorah candle. Menorahs hold nine candles, eight for the eight nights of Hanukkah, and a ninth called the shamash (meaning “attendant”) that lights the other candles. My toddler joined the fun, too! 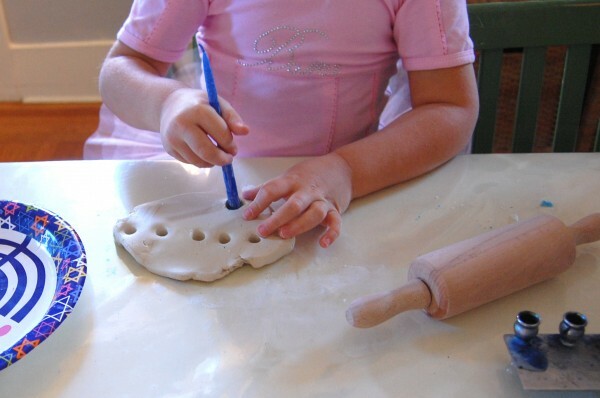 She’s been copying everything her sister does, and after seeing this magic, I wished I had given her a bigger piece of clay to play with. 3. 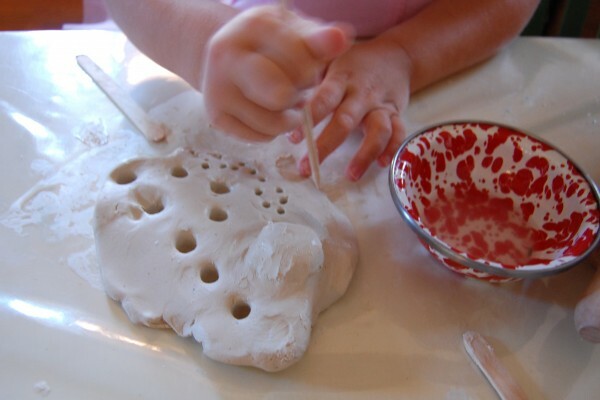 To make room for the shamash, we decided to build a little mound by making a ball of clay, scoring both sides of where it would connect with hatch marks, and then pressing the pieces together. 4. We used a little water and a popsicle stick to smooth out the edges. I read that if there are cracks in this clay it can fall apart once dry, so we were sure to smooth all those cracks right out with water. 5. 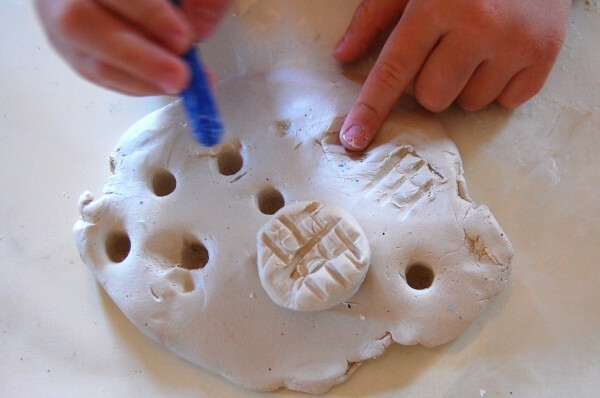 N decided to use a wooden stick to poke a pattern of holes all over the menorah. 6. 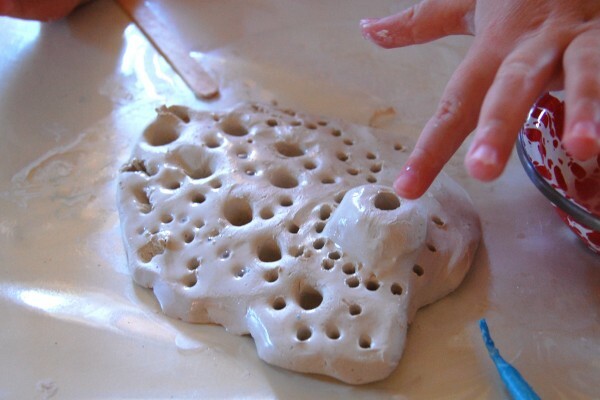 She added a hole for the shamash. 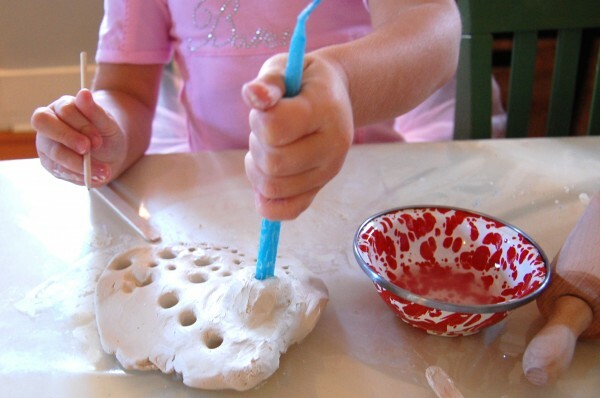 My little one was happy to play with a small pot of water and the goopy clay. 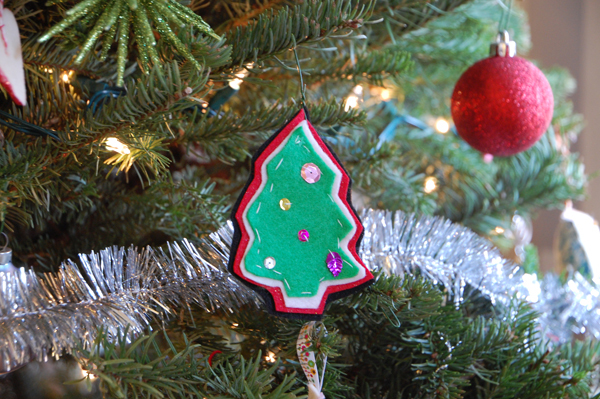 We’re enjoying the season, and I think we’ll make salt dough ornaments tomorrow! 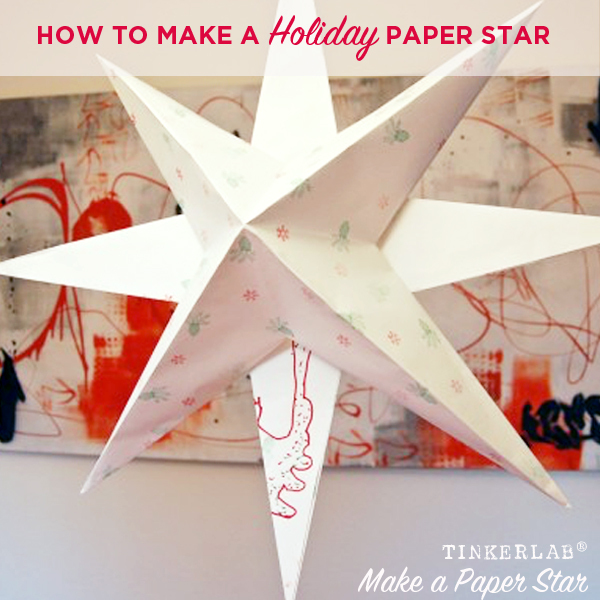 Today I’m going to share how to make holiday paper stars with your kids. 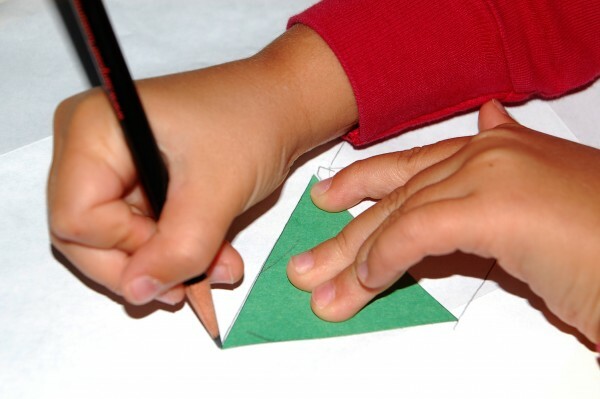 If you have young children, the first half of the project will be kid-centered as they color and decorate the paper as they like. 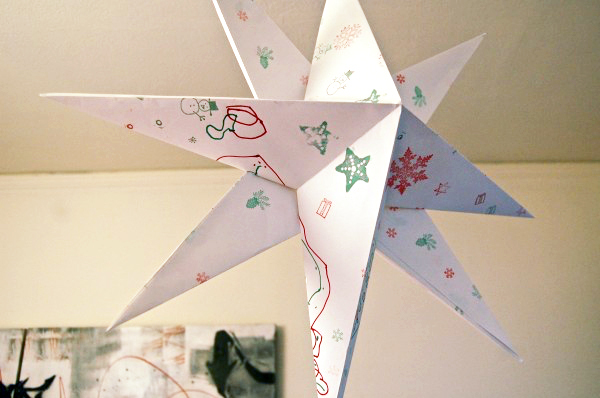 Once that’s done, adults will assemble the stars. 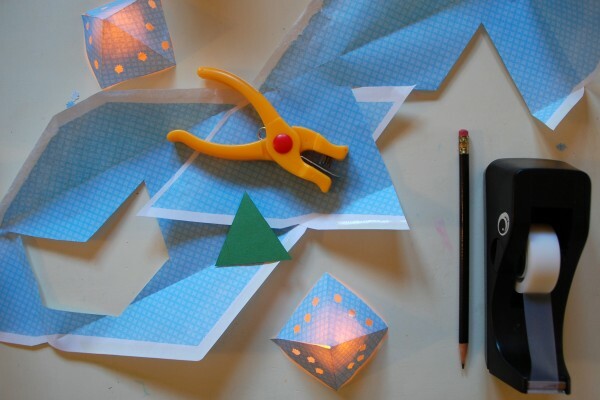 I found an easy, workable tutorial at The Magic Onions for our paper stars. I cut large squares from four sheets of 24″ x 36″ drawing paper. 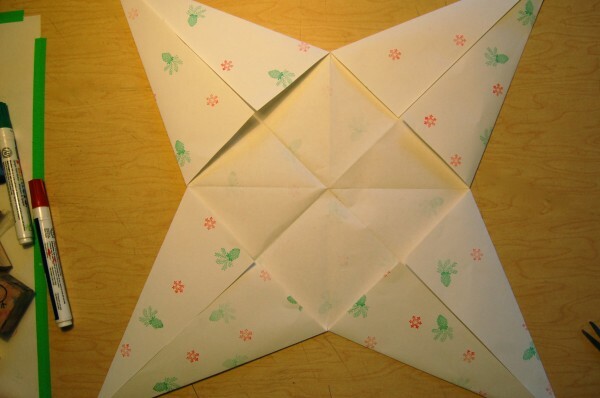 You know, the trick where you fold a triangle in the paper and then snip the excess rectangle off? I taped that extra rectangle to the table so that my daughter had a place to store her rubber stamps and pens. Pine cones and snowflakes in a limited palette of red, green, and silver. 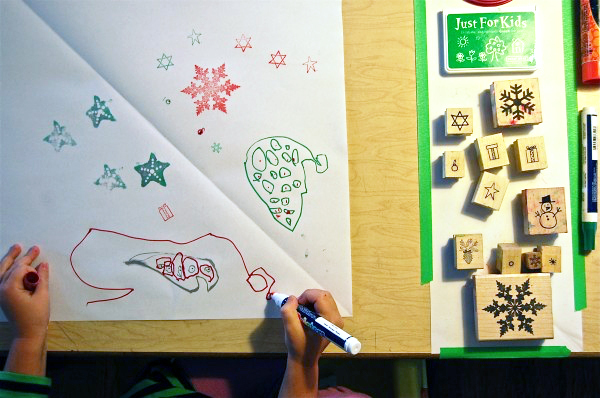 Snowflakes, sea stars, and Stars of David. That’s how we roll. The tutorial over at The Magic Onions is really clear, so I won’t get into the details here, but suffice to say that once you make one, you’ll want to keep cranking them out. They’re so simple! 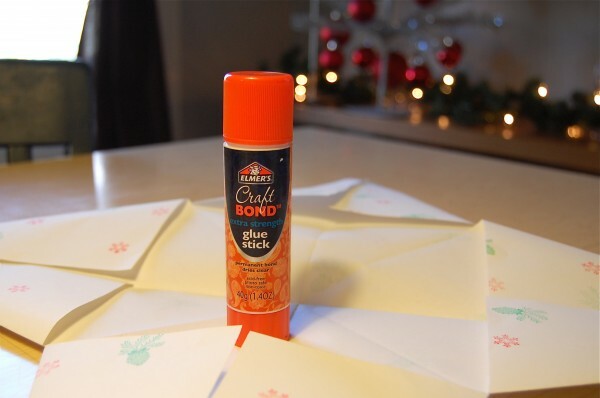 I used Elmer’s Craft Bond Extra Strength Glue Stick to seal the paper right up. Worked like a charm. I cut a piece of cotton string, about 3′ long, so we could hang it from the ceiling, and taped it about 3″ inside one of the points. 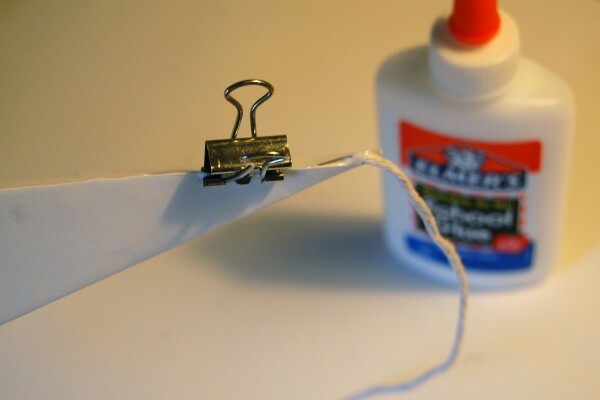 Then I ran a line of Elmer’s School Glue under the string to give it extra support and along the edge of the point. A little clamp helped keep it all together. Sticking the pieces together. This was a little tricky. I placed the pointy face of one star in a bowl, rested the other star on top of it, and added bits of school glue to hold it in place. I gave it overnight to dry, but school glue seems to dry in under an hour. 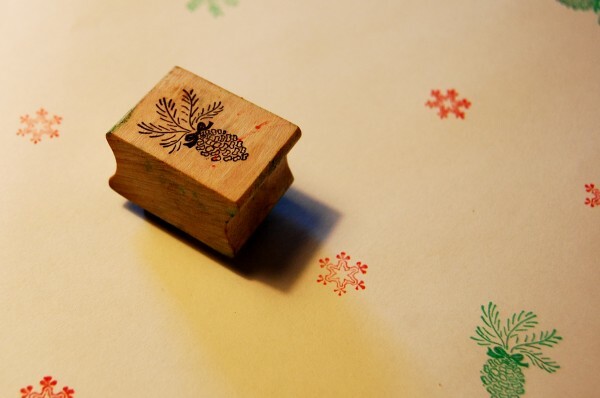 Since I already the drawing paper, stamps, and string, the whole thing cost $0.00! 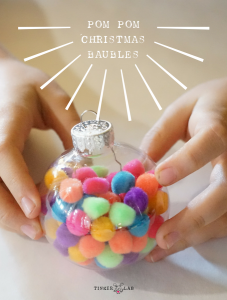 But the materials are so low-cost and flexible anyway, that I bet you could do it too with wrapping paper and ribbon after opening gifts on Hanukkah or Christmas. 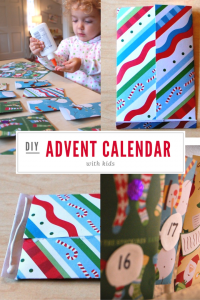 Or make them from all the extra art work your kids bring home from school. Newspaper colored with potato prints. What do you think?